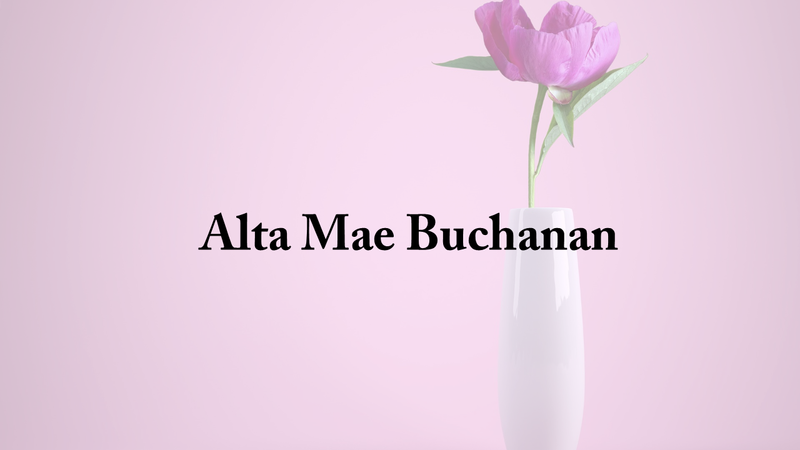 Alta Mae Buchanan, 89, of Lynn passed away on March 24, 2019 at home surrounded by her family. Alta Mae was born on January 5, 1930 on her family farm in Nauvoo. She attended Mt Vernon Missionary Baptist Church for 20 years. Alta Mae graduated from Lynn High School in 1948 and went on to own and operate Garrison Truck Stop. Alta Mae was a member of the Senior Citizens club and enjoyed fishing, flowers, going to yard sales, playing board games, making flowers, woodworking, puzzles and especially loved her grandchildren. Visitation will be held on Tuesday, March 26, 2019 from 6 to 8 p.m. at Nichols Funeral Home in Haleyville, where services will be held on Wednesday at 2 p.m. Brother Lawson Clark and Brother Steve Miles will officiate. Burial will follow in Ashbank Cemetery. Alta Mae is survived by her sons, Jimmy (Ruth) Clingan, Paul (Sandy) Garrison, Rodney (Kathy) Buchanan, Donald (Brenda) Buchanan and Danny (Kathy) Buchanan; daughters, Shelia (Robert) Wilson, Charlotte (Randy) Farris and Elaine Crump; sisters, Lois Nelson, Annie Paul Norris and Betty Sue Humphries; she was Maw Maw Mae and Maw Maw Buck to 18 grandchildren, and many great grandchildren; and her special companion dog Pippy. She was preceded in death by her husbands, Otha Clingan, Homer Garrison and Roy Buchanan; brothers, Edward Prestridge and J.A. Partridge; sisters, Melda Faye Greene and 2 baby sisters; son, Sidney Buchanan; great granddaughter, Hannah Bridgmon; and granddaughter, LeNae Wilson.